In terms of classroom learning and the Australian Curriculum, the exploration of message sticks brings together history, science, Aboriginal and Torres Strait Islander histories and cultures, literacy and art. Coupled with a trip to a museum and contact with a local Aboriginal Group where possible, the links to both Historical Knowledge and Understanding and Historical skills for Foundation to Year 3 are strong. As well as being sources of information of the past about which students can easily pose questions, message sticks are an example of how stories of the past are communicated, why museums have such artefacts and can elicit reflection on the impact of changing technology on traditional Indigenous practices. By also immersing students in the spiritual connection that Aboriginal Peoples and Torres Strait Islanders have with the land and sea and the great diversity of each group’s connection, students begin to understand why message sticks and other forms of communication (stories, dance, music, art) are so important to Indigenous identity. In terms of science, message sticks hit the mark for Year 1, chemical sciences and also a number of the Years 1, 2 and 3 English descriptions. Australia is a vast land. Not surprising then that it is home to a large number of different indigenous cultural groups. Over tens of thousands of years, “a rich diversity of tribal groups, each speaking their own languages and having a variety of cultural beliefs and traditions” has emerged (Hill, C. 2004). 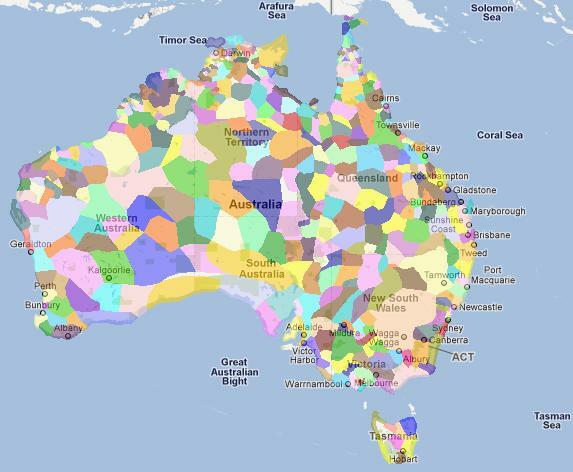 It is estimated that around 250 distinct indigenous languages were spoken in 1788 with around 600 dialectal variations. Message sticks have played an important part in communication between Aboriginal groups across the immense Australian landscape. In our classrooms, message sticks offer a way of understanding the diversity of indigenous cultures in a way that most students can relate to. Whilst the diverse oral culture of Aboriginal people is well-known, message sticks may not be something teachers are familiar with, hence this background briefing blog. Message sticks are a form of communication between Aboriginal nations, clans and language groups even within clans. Traditional message sticks were made and crafted from wood and were generally small and easy to carry (between 10 and 20 cm). They were carved, incised and painted with symbols and decorative designs conveying messages and information. Some were prepared hastily, like you might create a note left on a friend’s desk or a quick text message; others were prepared with more time to make the markings neat and ornate. There were always marks that were distinctive to the particular group or nation sending the message and often marks identifying the relationship of the carrier to their group. This way it could be identified and authenticated by neighboring groups and by translators when the message stick was taken long distances. Message sticks helped support the oral message that the carrier would provide, especially when languages of groups were very different. But there were enough marks to ensure that the original message would not be misinterpreted. More importantly, the message stick itself was a ‘passport’ which gave the carrier protection. When someone carrying a message stick entered another group’s country, they announced themselves with smoke signals and were then accompanied safely with the message stick to the elders so that they may speak their verbal message. Group members would then accompany the carrier safely back to where they came from with a reply. The message stick also helped to secure safe passage across long distances and through many groups. This was because each time the messenger was directed to meet the elders to show the stick and request permission to pass through and deliver the message to its final destination. The subject matter of message sticks varies much like the text types of many written languages. Notices about meetings and events, invitations to corroborees, ceremonies and fights, notices/ requests of marriage arrangements, notification of a family member passing and requests for objects are some of the types of information placed on message sticks. They were also used for trading journeys; curators know that many artefacts could not have been made at the locations where they were found because the materials they were made from, were found and traded across great distances (Jacob 1991, pg 260). 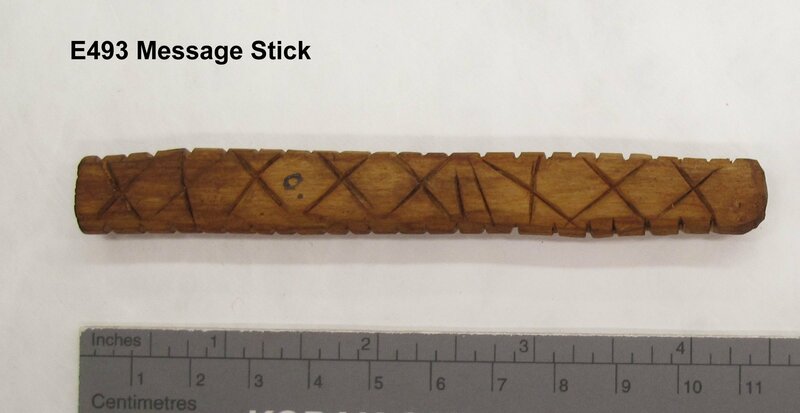 Some message sticks were created with unique markings that were used only at certain times, and were only allowed to be carried by particular people for special rituals. The story telling text types are generally not seen on message sticks. These of course are shared within the clan, passed down through rich oral traditions including The Dreaming, music and dance. These ‘stories’ of country vary greatly from region to region because they describe the journeys of ancestral spirits who created the features of a particular area. But not just the geographical features. Helen Nunggalurr from a clan in north–east Arnhem Land explains, “First all things in our environment were created by spirit beings which we call Wangarr. They created the different tribes and their languages. During their creation journeys they created animals, plants, waterholes, mountains, reefs, billabongs and so on. Today we can see their tracks in our land and where they stopped we can see their signs. These are the features in our landscape. This is why these places are our sacred areas which we must respect and care for” (Smyth, D.,1994, p 3). At Queensland Museum and Sciencentre you can see many examples of message sticks and engravers in the Dandiiri Maiwar Exhibition. In some cases, the museum has acquired the stories associated with particular sticks. For example, Bishop White of Carpentaria described how he delivered a message stick on behalf of an Aboriginal boy in Darwin to a boy in Daly Waters. Bishop White asked the Darwin boy to explain the message. The boy read the message symbols which requested headbands and boomerangs from Daly Waters. The Bishop delivered the message stick (shown below) and asked the recipient to tell him what the message was. The boy interpreted the message stick exactly as the Darwin boy had explained it. The essence of message sticks, apart from their obvious purpose, is the way they signify the carrier’s identity with a particular group (the senders). 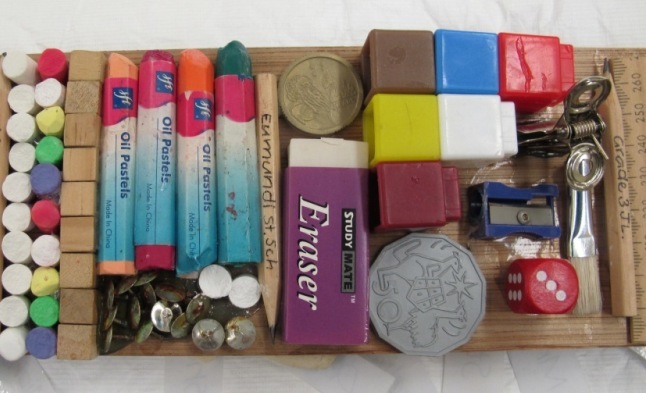 As a result of the WIK decision of 1996, Queensland Museum invited school groups to make message sticks called WIK sticks so that others could glean a sense of who they are just by viewing the stick. This idea could easily be replicated in schools and WIK sticks could be shared between schools from very different regions. 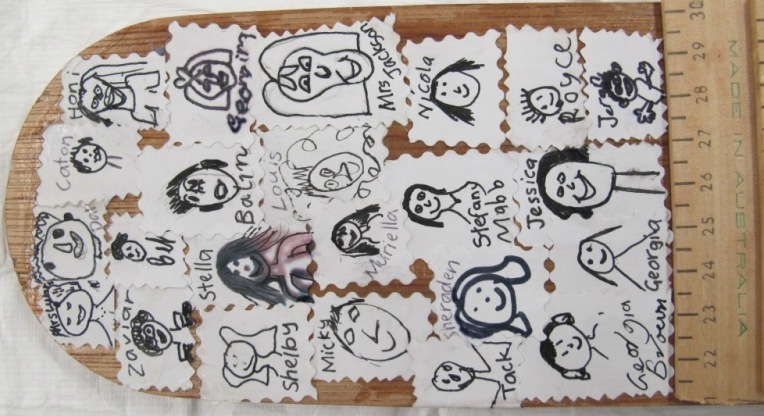 Individually, students could create small WIK sticks on thick cardboard to represent their own unique identities. In summary, message sticks are a rich source of historical and cultural learning for Foundation to Year 3 students in particular. Along with the many other artefacts on display at QM & S, the online resources and the various relevant loans kits, teachers can go a long way to developing an appreciation and respect for the great diversity and richness of Aboriginal Peoples and Torres Strait Islanders cultures and histories. Below you will find some interesting contemporary representations of message sticks with some useful reference sources and information to use with students in the classrooms or at home with your children. Jacob, T., 1991. In the Beginning: a Perspective on Traditional Aboriginal Societies, Ministry of Education, Western Australia, pp 311-313. This article continues the theme of early indigenous scientific knowledge which often centred around the collection of food. Most shell middens were created in ancient (pre-European contact) times and can provide valuable information about Aboriginal hunting and gathering practices. For thousands of years, Aboriginal people caught and ate large numbers of shellfish species in and around the mangrove mud flats and coastal areas along the Queensland coast. Often they would cook the meat and use the shells for a number of different purposes, or dispose of the shells in large dump sites. These dump sites would normally be near where they were camped and eventually form what is called shell middens. Shell middens have provided important information and clues for researchers about the Aboriginal people and the environment they lived in. They tell the story of the Aboriginal peoples’ diet, food sources for that particular area, what species were available, the impact of biodiversity, environmental changes and marine ecosystems. Different species of food sources found in shell middens include, mussels, oysters, clams, crabs, fish. These food sources were highly prized as today we know they contain valuable nutrients such as zinc, iron, calcium and vitamins such as A and B. These would have been hunted and gathered according to the seasons and particularly when they were in abundance. The Aboriginal people would have known when the oysters were at their fattest, the crabs were at their heaviest, the mussels in abundance from reading the seasonal signs around them. This practice is still used today by many Aboriginal people. Some of the species found included Geloina coaxan (Mud Clam), Nerita balteata (Lined Nerida), Telescopium Telescopium (Telescope Mud Creeper. Most of the food sources were collected during low tide as that was the time they were exposed in the mud or sand or attached to rocks and branches of the mangrove trees. Once they were collected they would have been immediately eaten and then discarded in a nearby heap eventually forming into a midden. 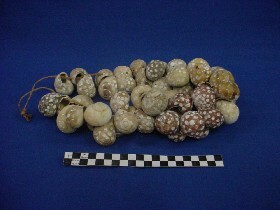 The Aboriginal people also found uses for the shells and used them for cutting and slicing or decoration. Every year at the same time the shell midden would grow in size. In the Hinchinbrook area, between the North Queensland towns of Cardwell and Ingham shell middens sites have been found and from the research tells the story that it is a particular area that would have supported a large number of people. Whilst middens are found there, a number of fish traps have also been found which reinforces that the area was a valuable nutrient rich environment. All shell middens and fish traps today are protected sites. They are protected under the Aboriginal Cultural Heritage Act 2003 and Torres Strait Islander Cultural heritage Act 2003. 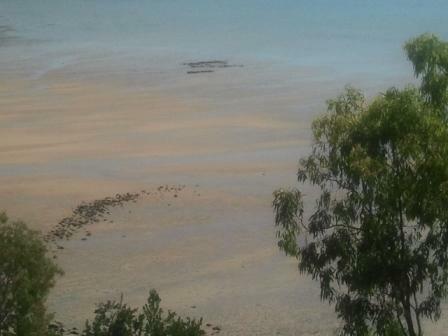 One area protected for artefact scatters, shell middens and fish traps is an area at Palm Island. Whilst shell middens have survived over thousands of years they are exposed to threats. Threats include cyclones, (a shell midden at the Townsville Town Common was damaged by a cyclone), erosion from water and wind, vandalism and development.